I never understood why Real Sword hadn't released one of these with AK compatible magazines. Would have been approximately 700x better than the awkward Type 97 magazine reacharound fumblemaster. Are Real Sword still active? dear e&l, why dont you make the onr with flat top rail? much more useful and playable. This is a stock photo they've found online so I wouldn't make too many assumptions yet! Now if you excuse me, I will scream and flail incoherently all the same. I think so - apparently you can order direct too. Hmm. It does look like it. I checked the 'news' section of their site and it hasn't been updated since 2013 but they have a year of the dog banner so someone must be pressing buttons over there. Strange they've not done an AR15. I gather Norinco are churning out CQ 5.56s so it would a nice and easy money maker for them. I would love to see a GBBR version. I still have a RS SVD up in the closet, never did get spare mags or a scope for it. Gunmane, the CYMA SVD midcaps will fit and feed in the Real Sword SVD just fine. I still own my T97, tricked out a bit. Now, here Im hoping for a quality replica of the x4 optics and railsystem. My top rail is currently crewed into the nylon top cover and I don't really like that, but the PEQ box is nice and snug between the top handle amd front sight. See, I always heard talk about whether or not they fitted that was inconclusive, might as well try it out. As for E&L making one of these, I'd be interested to know how they go about getting the dimensions and whatnot. "Agreement" with some Mainland official, sent someone over to Canada for the export model, or would they just get their hands on a Real Sword one and copy it directly? I assume the latter. Hey, how can one order direct from RS? I just checked out their email- both their website and email are inaccesible. E&L commented on this photo on Facebook. They said it was a paintball gun meant for LE. 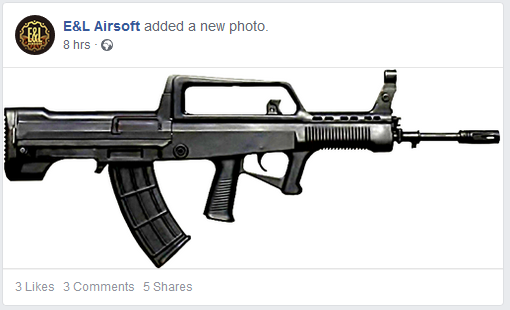 Sigh airsoft could use a nice type 97 or some of the other variants. Sorry for the false info guys! Eh, I got useful info in the conversation anyways. Bit odd that it be paintball, considering that like TM's type 89 and the JGSDF back in the day weren't some of the RS replicas set aside for military/police training?